Slow travel and delicious local food in Iceland. Meet the organisers of Crisscross food tours. Slow travel and slow food are at the heart of Crisscross as we travel by taste in a small group at our own pace. Our good connections to local farmers and food producers ensure that they are happy to open their doors to visitors and share what they do. With Crisscross I want to offer tours that focus on beautiful nature sites and delicious Icelandic food according to my believe that slow travel and tasting local food is the best way to get in touch with local history and culture. I have been a tour guide in Iceland for 20 years and a producer of healthy berry juice with wild Icelandic herbs and whey from 2013. During countless presentations on Farmers Markets I got familiar with many small-scale producers of artisanal food and realized that their produces deserve a wider audience. In 2016, when I started Crisscross, I understood that this was a great way to combine my passions for food and travel. 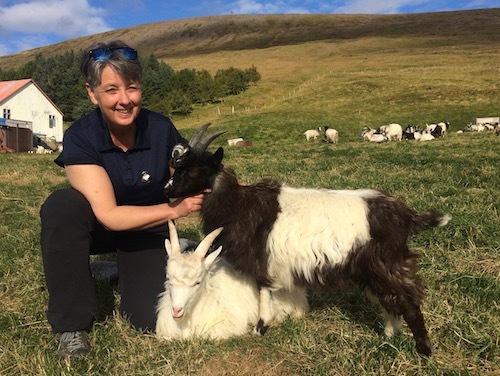 Two years later I sold my berry juice production (Islandus) to Erpsstadir Creamery (one of our destinations) and since then most of my time is spent crisscrossing with intriguing people interested in personal encounters and the essence of food. I guide personally many of our tours and use my extensive expert knowledge of Iceland to plan independent itineraries of tailor-made tours for small groups and families. Our scheduled tours focus on West Iceland, a region having the perfect combination of stunning landscapes, unique regional culture and friendly locals. It is easily accessible for visitors due to its proximity to Reykjavik. Our paths lie just outside the more visited sites in South Iceland and that is exactly how we prefer it! We are connected to nature in so many ways. Nature never ceases to teach us and inspire, with it's diverse beauty and endless cycles of growth and decay. Local food traditions tell us a lot about the life and living conditions of a nation. Times of abundance and times of scarcity leave their marks in the diet and daily habits. Through tasting food and meeting the people who prepare it, while surrounded by the nature where the food originates, we come in close contact with the local culture. On our tours we meet farmers and food producers who stand firmly in the history and traditions of Iceland, while at the same time constantly exploring and developing their products. All our hosts have a deep connection with their animals and the farm life and share their stories with great generosity. They are full of life and with them every day seems like a small adventure. We are ready for a new experience. Let the taste buds lead the way.